The past two weeks have been busy, and after a few sunny days with enough time for a long stroll things to do returned, as always, with really no time to write a posting. Add to this a bit of illness, and forgetting about the walks would be natural. However, these walks were truly uplifting. They have inspired me to look beyond the landscapes and the impressions they gave me. Today’s post might have a sequel, especially because I guess that more can be said about this topic. Duck decoys can be carved wooden models of a duck or another kind of fowl, but there is another meaning of this word. Duck decoys, structures to lure fowl into a trap, are a phenomenon that seems to stem from the Netherlands where the earliest mentioning of them dates from the mid-sixteenth century. The Dutch word eendenkooi, “duck cage”, clearly explains a part of the etymology of the English word decoy. Duck decoys were used also in England, Germany and Denmark. They consist of a number of curving ditches with screens on both sides leading to a net on a pond in which ducks and other birds can be trapped. A duck decoy is often situated in a small wood. I walked to the duck decoy of Breukeleveen -indeed in the fen country near the village of Breukelen, northwest of Utrecht- which is situated in such a place. In order to take pictures of a curved ditch and the screens I simply had to wait until winter, because otherwise you cannot see them. Legal history’s interest here is of course the right to use a duck decoy. In fact, several rights can go with the possession of a duck decoy. The most visible one is called recht van afpaling, “right to fence off”. From the heart of the duck decoy a distance of either 735 or 1130 meter is delineated in which no building is allowed nor any hunting by other people. The sign reads “753 meter”, which is remarkable, to say the least. This duck decoy dates from 1811. Since 1955 it is owned by the society Natuurmonumenten. 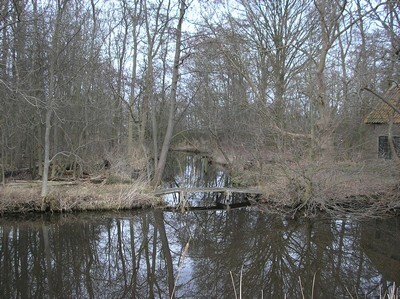 The surrounding wetlands are protected by Staatsbosbeheer, the Dutch National Forest Service. The bicycle path on the picture is some fifteen years old. The classic study on still existing old Dutch rights is by the world renowned archivist Eric Ketelaar, Oude zakelijke rechten, vroeger, nu en in de toekomst (Leiden-Zwolle 1978). The law for hunting around a duck decoy is further governed according to the Dutch Flora- en Faunawet of 1998 (changed in 2002) and other regulations. Duck decoys figure in recent Dutch jurisprudence, too. Ketelaar commented the important 1981 verdict by the Hoge Raad, the Dutch Supreme Court, on duck decoys. More on duck decoys in the Netherlands can be found on this website. Thanks to the services of Utrecht University Library you can read a number of back issues of the journals of societies for the history of Utrecht online on SABINE, the bibliography for the history of Utrecht. It helped me to find quickly two useful articles on duck decoys from 1979 by Désiré Karelse. The walking historian can shake hands with the armchair historian… Anyone interested in the history of English duck decoys should enjoy reading The Book of Duck Decoys: Their Construction, Management and History (1886) by Sir Ralph Payne-Gallwey. And why not mention that my halting place during this walk, a pub at Tienhoven, was very fittingly Het Olde Regthuys (The Old Court Inn)? Amazingly I somehow missed the duck decoys on the Frisian island Terschelling which features in two posts – here and here – on my blog. Lately I found a book by Piet Lautenbach, Eendenkooien. De laatste heiligdommen van Terschelling [Duck decoys, the last sanctuaries of Terschelling] (Assen, 2011). 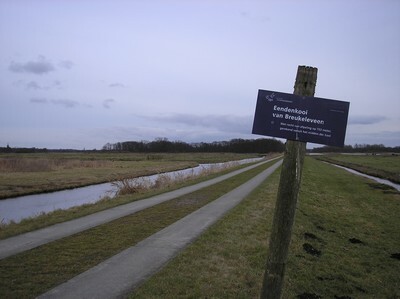 This entry was posted in Landscapes and tagged Legal history, Nature, Netherlands on March 15, 2010 by rechtsgeschiedenis.